How To Break an Alcohol Addiction | Help For Alcohol Addiction | New Dawn Publishing Co.
Is your drinking causing problems for you? It’s up to you to find out. Here, you can take a couple of tests that will help you evaluate your situation. Take a look at yourself. Basically you know your own condition. Do you feel you have a problem with alcohol? Somewhere deep inside, you know the answer. Look inside to see what you can learn. Do you sometimes think you have a drinking problem? Your intuition is almost always correct. What you answer is probably true. But how can a one-question test tell you anything? It’s simple. Most of the time, you deny the problem or hide from it by making excuses. It’s only natural to protect something so dear to you. But your defenses break down once in a while. So if you sometimes think you have a problem, you almost certainly do. Imagine yourself the morning after a bad drunk. Your body feels brittle and weak, your defenses shattered. You’re completely nauseated and you’re in pain. This morning you don’t have a morning drink to calm yourself and, for the moment, you truly feel the misery alcohol is causing you. You might go through this hundreds of times before you finally recognize the pattern. Almost everybody does. So how can you recognize the pattern of alcoholic drinking, also called “addictive drinking” or “problem drinking?” Here’s an easy-to-use definition to guide you. Alcoholic drinking is drinking too much, too often, and drinking out of control. Let’s look at this 3-part definition. Once again, trust your own judgment. If you feel you’re drinking too much and doing it too often, your feeling is probably correct. If you feel it is happening because you can’t control it, you are probably addicted. If alcohol eliminates your self-control, or if your drinking alters your personality, you almost certainly have a problem. Pay attention to your deepest feelings. Try writing them down. Write how you feel about your drinking, how you feel about how much and how often you drink, and what kind of control you have over it. You don’t need to analyze it. Just say what you feel…it may surprise you. Test #2: Do You Have a Problem with Alcohol? Instructions. Answer the following questions honestly. Then score yourself according to the key. Has your drinking caused any problems for you with your schooling or with your work? After you’ve had a drink or two, do you sometimes continue to drink for a longer period of time than you originally intended? Do you drink when you’re alone? 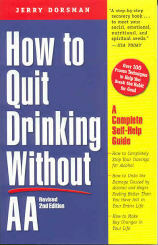 Have you ever thought that your life might be better if you could stop drinking? Have you ever felt guilty about something you did while drinking? Do you ever lie about how much you’ve had to drink? Do you sometimes drink to build self-confidence? Do you ever have a drink in the morning to steady your nerves or to get rid of a hangover? Do you tend to finish your first drink faster than most people? Have you noticed that you’re drinking more now or drinking more often than you used to? Do you crave a drink at a certain time each day? Do you sometimes wake up in the morning after a night of drinking and find that you can’t remember some of what you did or said the night before? Have you ever lost a friend because of your drinking? Have you ever been arrested because of your drinking (including any arrests for driving violations)? Have you ever been hospitalized or spent time in a treatment program because of your drinking? Key: If you answered Yes to any one of these questions, this is a sign that you have a problem with alcohol. If you answered Yes to any two, the chances are that you do have a problem with alcohol. If you answered Yes to three or more, you definitely have a problem with alcohol.